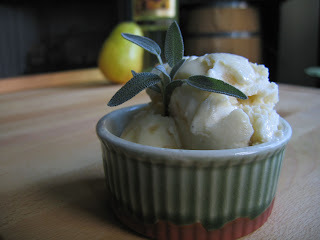 During this past fall, when I was still making a new ice cream every week, pears were all the rage. I wanted to do something with pear ice cream, but needed to add a twist to it. At this point in the season, there wasn't much to choose from in my herb garden except the sage. But this sounded like a great mix- pear and sage. I'm super happy with this recipe and the flavors. Sauteeing the pears and sage with wine first really enhanced everything. And with these flavors, you could serve this all winter long! Set aside to cool. 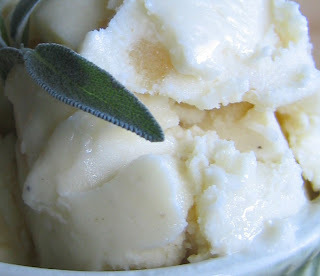 Remove the sage leaves before adding to the ice cream mixture. Temper the eggs with the steeped cream and return to heat. Simmer over medium heat, stir often, until the custard coats the back of a wooden spoon and leaves a definitive line when you run your finger on the spoon. Cool. If you have time, let that sit overnight in the fridge. Make according to your ice cream manufacturers directions, adding the pear mixture at the end.